In space, washing your hair can be a, well, hair-raising adventure, and one NASA astronaut has the video to prove it. 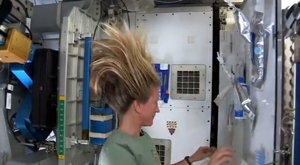 The new video of zero-gravity hair washing was recorded by American astronaut Karen Nyberg, one of six space travelers now living on the International Space Station. She posted it on YouTube and Twitter July 9th, in what is the latest astronaut video to show what it is like to live in space.